That’s a very simple answer, but it’s true. It’s also why becoming a life coach is so rewarding. Being able to help people transform their lives is a wonderful gift. We’ve all given and received help at some point in our lives. I know this, because without help, we would have never survived infancy, and we wouldn’t be able to function as communities. That’s how important it is to help each other. When we stop to help someone without any expectations, it can be greatly rewarding. It helps us to get out of our own mental drama and back into the real world. It generates meaning and purpose in our lives. It also brings us closer together as human beings. Listen. These days it’s more common to e-mail or text message a friend than it is to hold a conversation over the phone, much less in person. Take the time to talk to someone, anyone, and really listen to them. Everyone wants to be heard, but not many people are willing to actually listen. On a related note, the next time someone comes to you with a boat full of negative emotions, be aware of how you respond. You might find yourself joining in on the pity party and feeding into their personal story of woe. A great way to break this habit is to simply be aware of it. Practice listening to the other person without getting sucked into their personal story or your own memories. By doing this, you are automatically inviting compassion and insight into the conversation. Donate. Do you have clothes, dishes, appliances, or anything else that you no longer use or need? Then donate them to a charity or someone in need. Not only does this clean up the clutter in your home, it also helps someone who may be less fortunate than you. When my partner and I moved from Michigan to Georgia, we didn’t have much money, but we did have a lot of stuff that couldn’t fit in the car. On the very night that we were set to leave, I noticed that a woman was moving into one of the apartments nearby. She was a single mom with two kids and no furniture. We ended up giving her our mattress, extra food and dishes, blankets, and even a gaming console for the kids. It was one of the most amazing moments of my life to be able to pass those things on directly to someone who really needed them. We slept on the floor for weeks after moving to Georgia, and we didn’t regret it for a moment. A few months later, a friend gave us a bunch of used office furniture for free. Share Your Knowledge. Whatever you’ve learned, you can bet that someone near you could benefit from it. Perhaps your grandparents could use some help with their computer. Maybe your niece wants to learn how to play baseball. Give Someone a Ride. It sounds simple enough, but there are lots of people who have to schedule their day around a bus or could use some help getting around. Set aside time to help someone out with errands or just drop them off one-way so that their day is a little bit easier. Volunteer. There are so many volunteer opportunities that you’re certain to find something you can do to help. You can even volunteer online! This is a great way to get involved with your community as well as to change people’s lives for the better. Check out Serve.gov, VolunteerMatch or Volunteer.gov for free resources. Offer Help. 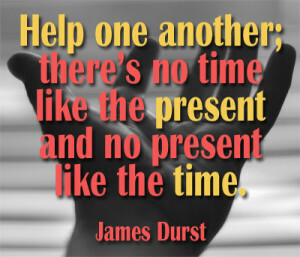 If you want to help other people, but don’t know how, then let them know it. Reassure them that it doesn’t bother you when they ask for things, even if you have to turn them down. Sometimes the most profound support is to simply let someone know that you’re there to help if they need it. Be Inspirational. Your friends, family, and even strangers may look to you for an example of how to live. This is human nature. We learn from each other. So set an amazing example by living your life fully and being true to yourself. This kind of inspiration is like a single flame lighting an infinite number of candles. It is boundless. Want to make a living helping people? You might be interested in becoming a life coach. Dr. Michael Craig is offering his next Logical Soul Coach Certification course starting in September, 2013.